You already know the basics: the structure of each section and the most important strategies. But these tactics require practice to master. Need to know where to find great TOEFL practice? Here are the best sites on the web for free practice that will get you TOEFL-ready! You already spend lots of your time each day on your computer or browsing the internet on your phone. Take the time to read from sites that write at a high level and on academic topics. Here is a round up of the best places that regularly publish current events and textbook-like passages perfect for you to use to practice TOEFL reading comprehension. Best of all, they are free. Here you can read short passages from On This Day In History, or search a topic that you are interested in and read for several pages about it. This website is useful because it is written in an academic tone and the website covers a wide range of topics. I particularly recommend the section of the website called Hungry History. It combines historical facts with information about food from different time periods. It is both interesting enough that you might impress your friends with some of the highlights from the passage later while being formal enough to make for a challenging read. The New York Times is an American newspaper known for its academic style. The vocabulary here is similar to what you will see on the TOEFL and the articles are of a good length. After reading each article, ask yourself, what is the author's attitude toward the subject? What is the main point of the reading passage? Use the vocabulary words that you do not recognize to practice vocabulary in context. The New York Times is written at a very high level, so if that is too much of a challenge, you might want to look into Upfront, their magazine for high schoolers. The site isn't as open as it used to be, but you can get a subscription or check to see if your library has a subscription. If you are a teen, during the summer, the New York Times also hosts a writing contest to encourage continuous reading. Simply respond to any article you read during that week, and you might get selected to be featured on their website. This is an excellent website for practicing both vocabulary and reading comprehension. First, you need to register for a free account through the site. Don't worry, they won't spam you, and the service is free, so there is really no downside. After you register for your account, you will take a placement test so you will get reading passages that are at the appropriate level. The questions are automatically graded and the system will keep track of how you do. Another great feature is that the website keeps track of what types of questions you get right and wrong, which is great for finding out what you need to target for the TOEFL. Occasionally you will be given a fiction passage through Read Theory, something that is not tested on the TOEFL, but overall, it is a fantastic place for reading material. Newsela is another site that offers leveled reading passages suited to each individual's needs. This website takes current events and rewrites the information at several different Lexile levels. New articles are added daily and many of them come with multiple choice quizzes on the side to check comprehension. Because these articles are about timely topics, students respond really well to them, so I love using this site in the classroom. Some of the articles can even get students thinking about issues that might come up as independent speaking or writing questions. Although most people think of the 140 character limit when they think of Twitter, I think of TOEFL reading practice. Why? People are constantly sharing newspaper and magazine articles using this platform. I love linking to interesting articles about culture, science, and the people who have shaped and influenced the modern world. These are the same types of passages you will encounter on the test day, so be sure to get in those extra few minutes of practice each day by doing something you already do already: checking your Twitter feed. 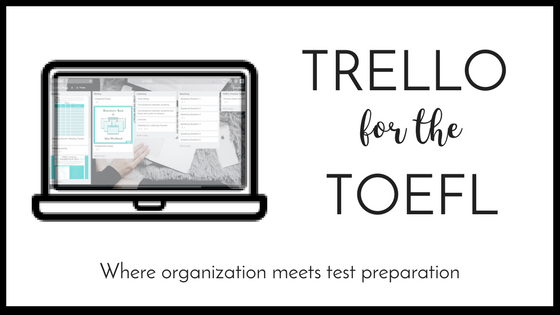 Whether you are brand new to the TOEFL or you have taken the test before, the best place to start when it comes to preparing for the writing section of the exam is from ETS itself. They have two very informative videos on the format and grading of both the independent and integrated essays. Knowing the criteria before writing the essay is essential. Teachers and tutors might want to consider watching this with students during class or session time because the information is so valuable. Click here to view the video on integrated essay and here to see the one on the independent essay. ETS also has previously released many independent essay topics, which can also be found in their Official Guide to the TOEFL book. It is easy to replicate and anticipate new independent essay questions because they follow certain clear patterns. I love posting writing questions on Instagram, and I use quotes each Wednesday to generate new writing prompts. Because one of the most common independent essay questions on the TOEFL is simply do you agree or disagree with the following statement, using quotes to as the statement allows you to have nearly unlimited practice. If you need a little bit more structure, be sure to get the One Month TOEFL Challenge printable. There you have 30 free essay prompts presented in an organized list to keep you on track. Improve Your Pronunciation and Fluency-- Free! In order to help yourself prepare for the speaking section, check out these great resources. This website is great for practicing specific sounds. Rachel, an English teacher, shows students how to position their mouths in order to make the blended sounds that are often difficult for non-native speakers. Rachel guides students through minimal pairs and reductions in order to help students reduce their accent and sound more natural. She has a ton of high quality, free resources, that you can find here. This website is great for improving your vocabulary as well as your speaking abilities. The way it works is quite simple. First, you listen to a video. The video is captioned, and you can click on any word in the script in order to get a definition and repeated pronunciation. At the end of the video, hit the "learn" button. The video will automatically remove certain words. You need to type in the missing word that you hear, and the definition will appear again. All of the above is free with a basic registration for all the videos on their website. You can also get a limited amount of speaking practice with the free account. Essentially, you repeat a line and their voice recognition software tells you how accurately you performed. If you want more personalized attention and even more speaking practice, you can upgrade to a Premium or Platinum account, giving yourself access to more speaking quizzes and even online tutoring. The link to the website is here. This website breaks pronunciation down into several helpful categories. You can listen to the pronunciation and repeat the word or pairs of words. The sections on verbs are particularly useful, and the resource is free here. If you've gone through all of the speaking practice in your book, don't start to stress. Use your friends, your creativity, and a few specific websites to keep producing extra material to practice with. For independent speaking questions, talk to your friends and family in English whenever possible. Yes, the questions on the actual test are a bit artificial, as is the amount of time you need to speak in order to give a response. But think about what ETS is trying to replicate. They want you to be able to be able to give information about yourself, your background, and your opinions in real time, without pauses. This is exactly what you do when your friend asks you what you want to do tonight. Although he or she might not ask if you prefer to go to the movies or if you'd prefer to participate in a physical activity, like ice skating or hiking, you still need to tell the person what you think and why. This every day practice will make you feel more comfortable. If you have another friend who is studying for the test as well, you can actually do this with time constraints. Meet at a coffee shop and have each person write down 5 new questions and put them on slips of paper. Have the other person draw a slip, respond for 45 seconds, and then together evaluate the response. Then repeat the same process so both you and your friend get time to answer and make improvements. A bonus to this setup is that you are thinking like the makers of the test. Remember to make some questions completely open-ended while others should have two clear choices to pick from. Making new integrated speaking questions is more difficult, but it isn't impossible. In order to practice Speaking Question 3, start reading the students newspaper from your dream school online. This will get you familiar with the types of announcements that would happen on a college campus. Teachers might consider bringing in several copies of a local college newspaper, assign students different articles to read and create transcripts for, and then have the student "present" to the class. To get more speaking practice for Question 6, watch a short clip from Biography.com's Classroom section and answer one of the questions from the listening comprehension section verbally. Often students find the listening section quite difficult, and as a result, it is easy to go through the listening exercises in textbooks quickly. How can you study when all the exercises are over? Take a look at these excellent websites in order to help students improve their English skills and get ready for the lectures on the TOEFL. If science lectures are particularly hard for you, this is a great place to practice. Not only can you sort videos by length and difficulty (make sure you select grades 9-13), you can also limit the videos to whatever type of science lectures you think are particularly hard. This website has everything from lectures on astronomy to biology to earth science to medicine. If you watch more than 3 videos a day, you will be asked to create an account, but this is free and PBS is a well-respected educational company, so do not have any concerns about making an account. With your account, you can also save your favorite videos to watch again, which is a particularly useful feature for teachers and tutors. This website provides a written transcript of each news story it reports. A dictionary is automatically linked, so this can also really help you with your vocabulary as well. This is a great place if you struggle with the Listening section and the videos on PBS might still be too difficult. Also, you will stay current with the American news by watching this channel, which is another great benefit. On this website, you can find lectures on a wide variety of topics. Business leaders, government leaders, and well respected scholars are all here. You can search by topic and you are sure to find something that interests you because they have over 1000 lectures! Also, many of these have been translated into other languages, so a transcript might be available in both English and your native language. If you go to the link for the new Ted Education section, each video comes complete with a short quiz, so you can test your listening skills! Some videos here also have a link labeled think; if you click on this, you will have additional essay questions to practice with that relate in some way to the video you just listened to. This is a great, and very interesting, source for lectures! There are many different topics here, from American history to how the universe was created, so find something that interests you! Also, many of the videos have transcripts available as well. If you want to watch some of their awesome documentaries, you could learn a lot about American culture while getting great listening practice. After I raved about how much I loved The Men Who Built America, one of the students in my class watched the entire series by renting it from the library that very weekend. She told me that my recommendation was great and that it exceeded her expectations. This website provides a place where ESL students can take tests made by ESL instructors. Use the highest level available on the site, High Intermediate, for students planning on taking the TOEFL soon. If your English isn't quite there yet, but you aren't taking the test for a while, you may want to start at a lower level and move up after you have built your skills a bit more. Regardless of what level you choose, the process is always the same. After you watch a public domain video (the length of which varies), you can take a quiz that will be graded automatically. Teachers and tutors can save time and students get instant feedback. This website is really a win-win for everyone. Bonus tip: Check out the videos I've made over on ESLvideo.com. All of the questions that I've created are modeled after those on the TOEFL. That means you have lots of listening practice--free. You can find them all here, but be sure to subscribe to the Newsletter because there are some listening practice questions made exclusively for those VIPs in my #TOEFLTribe. PS-Teachers and tutors, check out my tutorial on how to create and use ESLvideo.com with your students.